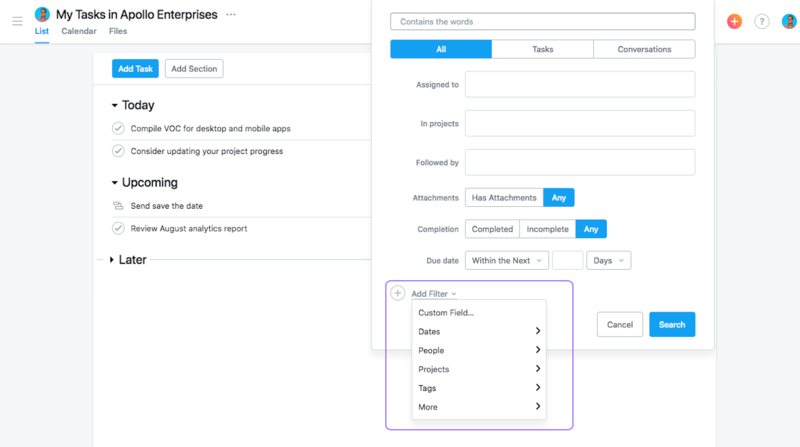 Search allows you to find any task, project, tag, person, or Team in your Workspace or Organization. Press Tab+/ on your keyboard to focus on the search bar. To run a basic search, type the name or title of any object in the search bar. Enter a person’s name in basic search to access their My Tasks. 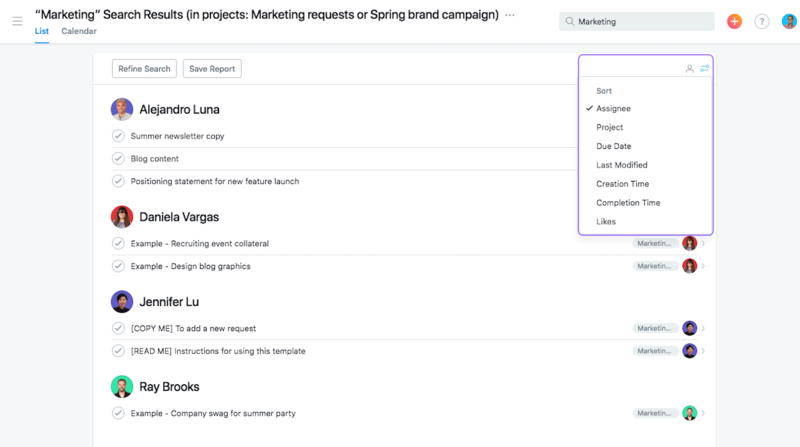 The results of your search will then appear in the main panemain pane When you select a project, tag, or person, you will see the relevant list of tasks in the main pane. Read more . Full text searches only returns tasks, subtasks, and conversations in the results. 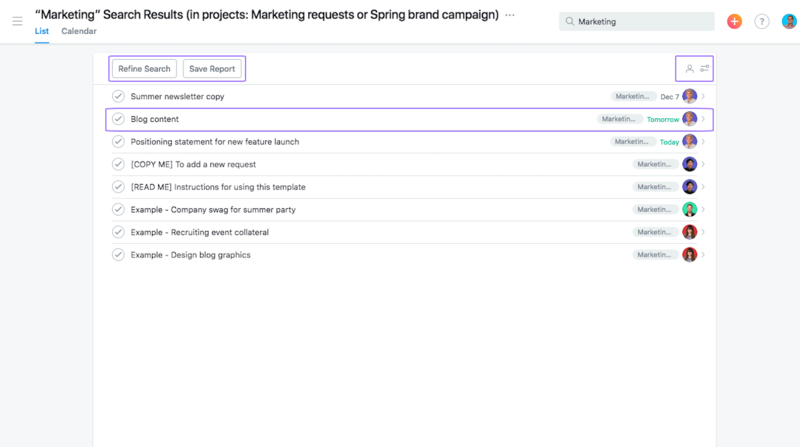 Search Views are lists of tasks that meet the criteria you specify. 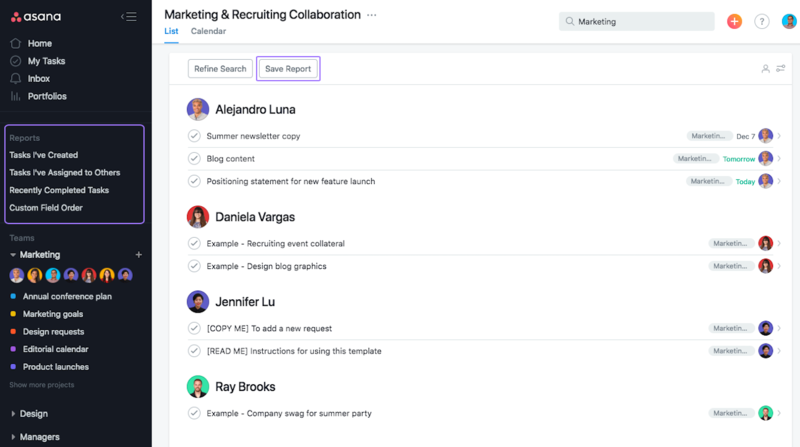 Create a Search View to find any specific group of tasks or conversations. The results of your Search View will only show tasks you have permissions for. Therefore, your colleagues may see different results, even if you’re both searching with the exact same parameters. In the Advanced Search window, you will see a number of parameters that you can use to search for tasks or conversations. Click Add Filter to use additional search parameters. When you create a Search View, every field is optional. Once you’ve established your search criteria, click the Search button. The results of your Search View will appear in the main panemain pane When you select a project, tag, or person, you will see the relevant list of tasks in the main pane. Read more and the name of the Search View will appear at the top of the headerheader The header is part of the user interface between the top bar and the main pane and lets users navigate projects. Read more . 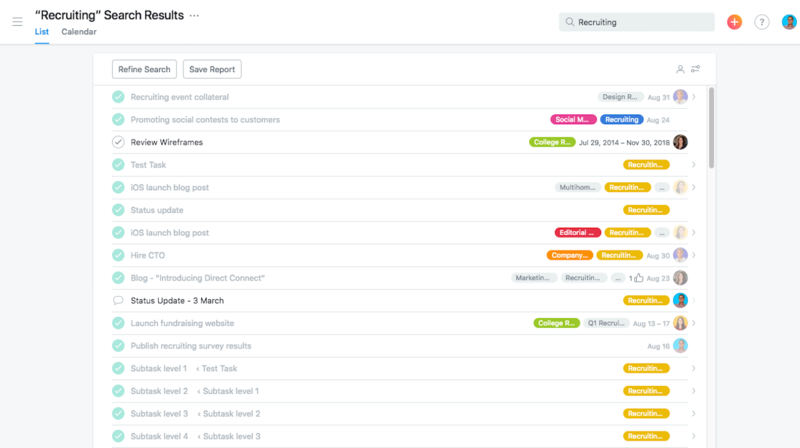 Search views display tasks and conversations that meet the parameters you’ve set. To add a task to your results, create a task that meets these parameters. Select Sort for a variety of fields to sort your search results by. If there are Search Views you will use regularly, you can save them as reports for easier access in the future. Click the Save Report button to save your Search View as a report. 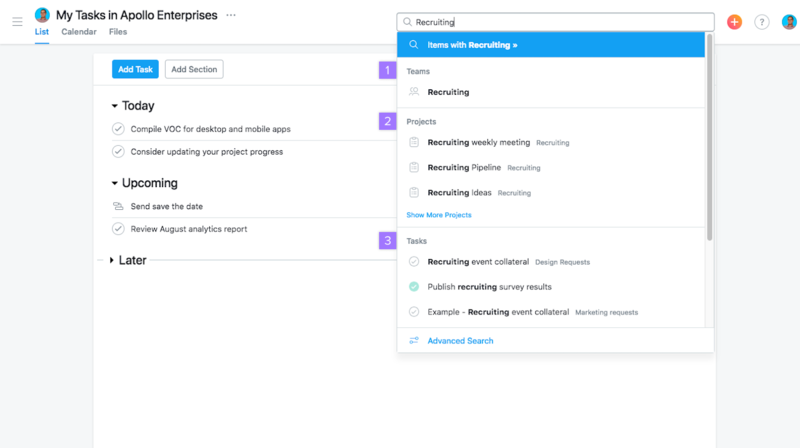 Once saved, your Search View will appear under your Reports section beneath your favorites at the top of your sidebarsidebar Use the sidebar to navigate to the dashboard, starred items, projects, and teams. The sidebar can be collapsed. Read more . Saving a Search View as a report saves the search parameters, so your report will update as you and your colleagues continue to work on tasks. Tap the three dot icon next to the title to rename a report. You first need to save a report in order for this option to appear.